We would like to take a moment to familiarize you with the Liberty International Network fellowship. 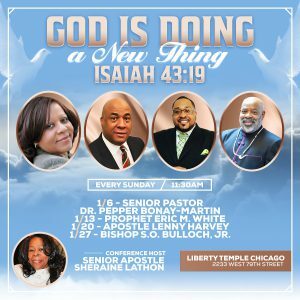 Liberty Temple Full Gospel Church & World Outreach Ministries was founded in 1982 in Chicago, Illinois with 2 members. Since then, it has grown into a robust network of Liberty Temple Full Gospel Churches, covenant ministries, business entities and other affiliates that have a oneness of heart, mind and spirit and whose ultimate purpose is kingdom advancement. 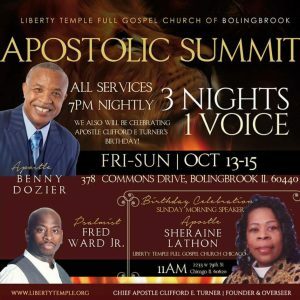 We are an Apostolic fellowship, which means an Apostle provides oversight to the entire network, and the people reflect an apostolic nature of unity, sacrifice, and service. An Apostle is a sent one, a specially commissioned messenger of Jesus Christ. According to Ephesians 4:11; an Apostle, as well as other five-fold ministry gifts, have a specific purpose of equipping and perfecting the saints. God has mandated my wife and I to equip and galvanize a team and an army of believers, prophets and teachers that will fulfill the great commission and demonstrate the same unity, power, love and family atmosphere as the church in the book of Acts. We are well on our way to being a witness in our homes, our communities, our cities, and the uttermost parts of the world. If you sense the call of God on your life; if you are looking for answers; if you have a sincere desire to know God and to carry out His purpose…then you have come to the right place. We aren’t just building great churches, we are building great people…and we endeavor to do this one sermon at a time. On behalf of the entire Liberty International Network Family, thank you for visiting us. Clifford E. Turner Ministries and the Liberty International Network’s vision is to establish a network of individuals, communities, businesses and nations that will reflect the character, principles, and love of our Lord and Savior Jesus Christ, impacting every aspect of society, including the municipalities, marketplace, and ministry. To establish ‘life training centers’ in every major city and in every nation that will educate, inspire and impact every aspect of one’s life. To develop programs, seminars, conferences, plays, movies, and products that teach, train, and inform for the betterment of the whole person, with a particular emphasis to target the inner city, low income segment, and the generally under privileged. To establish a network of individuals, communities, nations, and businesses that will provide the support system that will aid the targeted segment physically, emotionally, and financially. To raise up ministers, prepare the Body of Christ for the Great Commission, equipping the saints for the work of the ministry; to train and release five-fold ministry. Holywood Studios – a film and production company that will produce wholesome and uplifting movies, plays, and various other forms of entertainment. 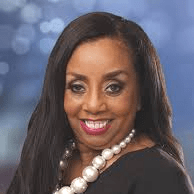 Denise M. Turner Foundation – A charitable organization that will focus on supporting various causes including AIDS research and training, breast cancer research, and engageing underprivileged youth. Cedar Life Publishing – a Christian book publishing company that will specialize in various spiritual, motivational, financial and self help publications. The Liberty International Network – a consortium of religious organizations and leaders that help to train, mentor, and inform on issues both religious and non-religious. House of Liberty Records – an in-house musical recording studio and production company. The Eagle Awards – an awards and recognition process that recognizes those who have made exceptional contributions in their communities, businesses, and careers.